WoodBlocX is a unique product that enables you to create and build almost any structure you could wish for in your garden. It’s just like giant Lego for your outside spaces. Woodblocx is easy to use, attractive, strong and durable. The individual BlocX, made from sustainably-sourced wood, are light and easy to handle, and fit together using dowels made from recycled plastic. You need no specialist skills or tools to put together a WoodBlocX design, yet is solid and strong, and will not distort, bend or collapse for at least 20 years. They are perfect for creating Raised beds, planters, retaining walls, ponds, edging, seats and more; in fact WoodBlocX lets you build almost anything for your garden. To see for yourself just how easy it is to build a WoodBlocX raised planter, watch this short video where Lee will show you how he went about transforming his garden with our bespoke raised planters. Whatever you want to build in your garden, build it with WoodBlocX. We had a lot of fun making this short video and really wanted to get across just how much our WoodBlocX are similar to building things with Lego, but on a ‘grown-up’ scale. 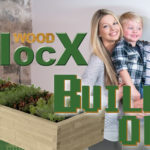 One of the best things about WoodBlocX is that they let you get creative and build the garden you have always dreamed of. You don't need any real landscaping experience to do it, in fact it's so easy to build if you can knock together something in Lego you're already half way to building with WoodBlocX! It's not every day that you get to play with a giant Empire State building made of Lego as well, and Tyler (our Billy the Buildmaster) really enjoyed the opportunity to get his hands on this monster Lego build; although I think Warren Elsmore and his team were keen to keep it resembling the Empire State than the Leaning Tower of Pisa... We were also lucky to be able to use the new Botanic Cottage at the Royal Botanic Gardens in Edinburgh as our main location to. If you haven't been to the Gardens in Edinburgh before, it's well worth a trip. They have a wonderful collection of plants from all around the world, and a great spread of Raised Beds too.. even if we do say so ourselves!